I have neither read Michael Morpurgo's children's novel nor seen the acclaimed National Theatre production of War Horse. I came to the material fresh, though wary of Steven Spielberg's attachment to it. To my mind, Spielberg is a supremely flawed director, for whom story is subservient to sentiment. His films are peopled with father-less children; heroic underdogs; and they have a quite risible tendency to refocus history on the few good acts rather than the wider evil. I find this inability to look bleak truth in the eye somehow insulting to those that lived through those times - a slippery fiction - and sadly, WAR HORSE is no exception. For Spielberg has created a drama about a war in which millions died that continually cuts away from tragedy and focuses on sun-dappled scenes of goodness. It is emotional manipulation of the most vulgar kind, despicable, and dishonest. The story is meant to be one of the triumph of the underdog, and the triumph of love and loyalty. Ted Narracott (Peter Mullan) is a poor farmer who buys a beautiful thoroughbred rather than a plough-horse to spite his landlord (David Thewlis) and palliate the pain of surviving the Boer War. 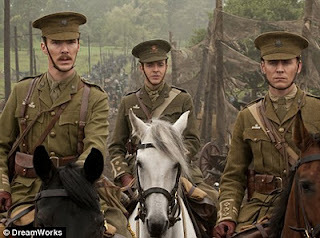 His son Albert (Jeremy Irvine) turns "Joey" into a working horse against everyone's expectations, but the pony is requisitioned by Captain Nicholls (Tom Hiddleston) and taken to war. As the cavalry is decimated by German mechanised units, the horse passes into the hands of a deserting German boy (David Kross, THE READER), then into the hands of a sweet French farm-girl and her grandfather (Niels Arestup) before being captured by the Germans to pull artillery. It is thus fully a hundred minutes before our War Horse finally makes it to the front line, stranded in no-man's land, and cut free by a German and a Geordie (Toby Kebbell) in a scene clearly meant to evoke the common plight of the honest soldier. Finally, she is reunited with Albert, in an ending as endless as THE RETURN OF THE KING - first a reprieve from the doctor (Liam Cunningham), then a reprieve from an auction, and finally a ludicrously over-coloured reunion with mother (Emily Watson) and father back in Devon. This film is technically accomplished, particularly in its depiction of the front line. But its substance is confused and contradictory - the fault of Spielberg and his screenwriters Lee Hall (BILLY ELLIOT) and Richard Curtis (of all those awful fantasy-London films such as NOTTING HILL and LOVE ACTUALLY). On the one hand, Spielberg wants us to sympathise with honest working folk - Ned Narracott and the Grandfather in France who bid in auctions against evil capitalist materialists. Then again, he has an almost Downton-esque deference towards descent upper-class chaps who promise "man to man" to take care of horses. No-one is really evil here. Ned Narracott isn't really a feckless drunk. Grand-pere isn't a coward but a principled pacifist. Even the German generals just have a job to do. No-one is killed on screen. And of course, we never believe a major character is really in peril. There are two scenes in this drawn-out farce that are worth a damn. The first is a scene where Major Jamie Stewart (Benedict Cumberbatch) - a gentleman cavalry officer of the old school - is unhorsed by a German artillery attack and mocked by his opposing officer. This moment - Major Stewart's resignation and realisation - sums up the tragedy and stupidity of the Great War. A generation that had been bred to gallantry - that should have learned from Crimea - finally had their illusions shattered by the first mechanised war. The second scene is the depiction of going over the top at the Somme and the aerial pull-back showing body upon body impaled on barbed-wire wooden fences and trampled into the mud. There is the horror of the war. One doesn't need the deliberate emotional manipulation of a stranded horse to provoke the audience's pity. WAR HORSE is on release in the US, Canada, UK, Australia, Singapore, Thailand, Brazil, Hong Kong, Israel, Ireland, Malta, Poland and Spain. It is released on the 19th January in Greece; on January 26th in Denmark, Kazakhstan, Russia, Slovenia, Estonia and Lithuania. It is released on February 2nd in Belgium, Hong Kong, the Netherlands, Norway and Turkey; on February 9th in Argentina, Hungary and Romania; on February 17th in Germany and Italy; on February 23rd in France, Portugal, Finland and Sweden; and on March 2nd in Japan. Great review - I generally agreed with all your points. It's definitely way too "Speilberged", to be sure, but as usual, the visuals kept me so enthralled most of the time that it was hard to notice a lot of the sappiness. The ending, in particular, looked so much like a John Ford western that it's practically impossible to believe it was coincidental. War Horse is an exceptional film. But I do believe that this ToI review has been more generous to it that many Western critics. Although not commercially unsuccessful, this film is clearly not oriented towards non-artistic film goers. But even from an artistic point of view, the war-theme depicted has nothing to offer that other classics like Saving Private Ryan or No Man's Land haven't already done. The only refreshingly new scene in the movie was the (fictional) banter between a German and an English soldier engaged in freeing Joey, when he's stuck in the cross-fire. Fictional or not, Spielberg did manage to bring forth the (animal loving) human being behind the rifle triggers and bayonets, and for that he deserves credit. I loved the movie and so high rate it high. But no harm in expecting greater things from the greatest. I enjoyed this movie "War Horse". The horses looked real. The direction was excellent. I would like to see it again.